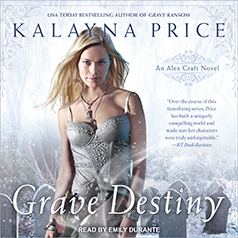 Kalayna Price presents the thrilling sixth book in the USA Today bestselling Alex Craft series. Grave witch Alex Craft can speak to the dead, and that makes her a dangerous enemy for anyone with something to hide . . .
Alex is still trying to come to terms with her changing powers and her growing ties to Faerie when a case she'd rather avoid falls right into her lap. A fae prince desperately needs Alex to investigate a politically sensitive murder. She reluctantly agrees to the case, taking FIB agent Falin Andrews along as her backup. But as Alex begins to delve into the mystery, she realizes that the intricate web of alliances and intrigue in the Faerie courts is strained to its limits. War is about to break out, one that threatens to spill over into the mortal realm. This murder is tied right to the center of centuries-old arcane unrest, and if Alex isn't careful she may follow the twisting path ahead of her right into her grave end.